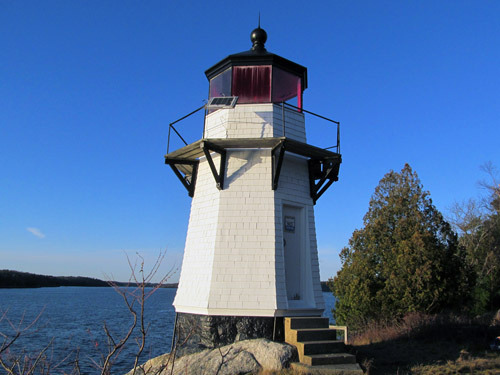 Perkins Light is located on an island near Marrtown in the Kennebec River. It is the most southern of a series of four lights commissioned at the end of the nineteenth century whose purpose is to mark the channel for the ships constructed in Bath. The entire island is an undeveloped state park and is geographically a part of Georgetown. The buildings are on the western side of the island and can only be seen from across the river in Phippsburg. Founded in 2003, Friends of Perkins Island Light, a chapter of the American Lighthouse Foundation, has been responsible for the maintenance and restoration of the light station. Status: Active aid to navigation owned by the U.S. Coast Guard and licensed to the American Lighthouse Foundation. The Friends of Perkins Island Lighthouse – a chapter of the American Lighthouse Foundation, is dedicated to restoring the historic lighthouse. Perkins Island Light Station grew over a period of a couple of years following the erection of the wooden light tower in 1898. A boathouse and pyramidal fog bell tower were constructed fours later in 1902. Another four years would pass before the U.S. Lighthouse Service constructed an oil house at the light station in 1906. The lighthouse was originally outfitted with a fifth order Fresnel lens, but following the station’s automation in 1959, the classical lens was removed in favor of a more modern optic. By the 1960s, the former keeper’s dwelling and outbuildings were transferred to the state of Maine – all except the light tower, which continues to be owned by the U.S. Coast Guard.